Gas-fired Power Plants - Where are the hazards hidden? Gas-fired power plants are growing in popularity. Canada has already begun to phase out coal-fired power plants in favor of gas-fired power plants. Gas is less expensive and a cleaner form of fuel than coal. However, with a surge in gas-fired power plants being built, a closer look needs to be taken on the fire hazards within these plants. In 2010, the Kleen Energy Systems Power Station, a combined cycle gas and oil power plant, had an explosion in the turbine building when natural gas was being purged from the gas line. Six people were killed. In 2014, the Didcot B Power Station, a gas-fired plant, had a major cooling tower fire. The fire spread from one to three cooling towers. Luckily, no one was injured. However, it does serve as an example of what can happen in gas-fired power plants and the need for proper fire protection. Fire hazards are abundant in gas-fired power plants. With natural gas, lube oil, and combustible materials throughout these plants, a small spark can grow into an inferno. Gas-fired power is on its way to becoming one of the biggest producers of power in North America. With less than 20% of the global coal-fired capacity residing in North America, gas is bringing up the rear and establishing itself as a contender for king of energy production. But what are the fire hazards in these plants? Continue reading this excerpt from our article Fire Hazards + Fire Protection for Gas-fired Power Plants or watch the video below. 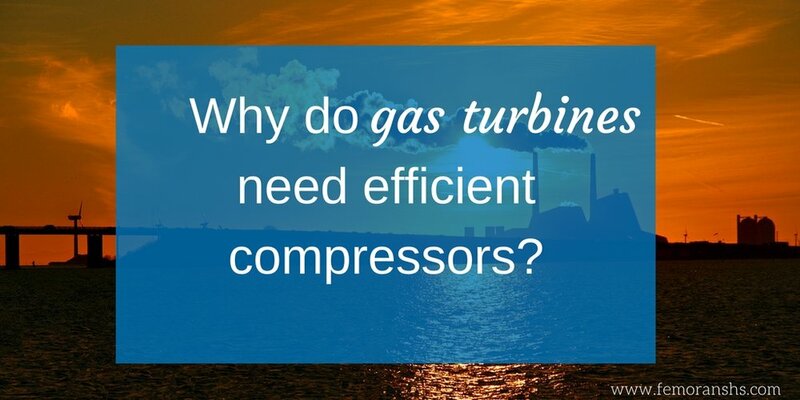 Why do gas turbines need efficient compressors? Natural gas power plants need to run efficiently so the plant doesn’t use more of the energy that it produces than necessary. It takes a lot of energy to run a power plant, but the more energy the power plant uses to run the facility itself, the less it has to sell. While natural gas power plants use a fair amount of the energy it produces, it would need to use much more energy if their compressors weren’t efficient enough, reducing profits. 1) A compressor draws air into the engine. It becomes pressurized and goes into the combustion chamber. 2) The combustion system has a ring of fuel injectors that inject fuel into combustion chambers where it mixes with the pressurized air. Both the gas (fuel) and the air have been compressed. They are then heated to 2,000+ degrees and sent to the turbine section. 3) In the turbine section, the gas/air mixture expands, rotating the blades inside the turbine. The rotating blades serve two purposes: pulling in more air and spinning a generator, which produces electricity. By having efficient compressors in a gas turbine, natural gas power plants can produce more energy while using less. This increases their production and their profit. Purpose: To inform plant engineers and engineering firms of the fire hazards associated with gas-fired power plants and the related fire protection options. Where are the fire hazards in a gas-fired power plant? How do these areas pose a fire threat? What fire protection will mitigate the fire hazards? Cooling towers are deceptive by name. It's a cooling tower. It has water flowing through it. Despite these facts, they do pose very real fire hazards. Cooling towers contain combustible materials throughout the structure: polyvinyl chloride (PVC), fiberglass reinforced plastic, acrylonitrile butadiene styrene, polypropylene nozzles, and wood. While the water flowing through the cooling tower may hinder a fire, the water is not everywhere. There are dry spots and occasionally the water is turned off for maintenance. Hot work accidents, smoking, or electrical arcing can cause fires that can spread quickly with the abundance of fire fuel. Another way cooling tower fires begin is from outside sources like Didcot B Power Station. NFPA 214 states, "A significant percentage of fires in water cooling towers of combustible construction are caused by ignition from outside sources such as incinerators, smokestacks, or exposure to fire." It goes on to explain fires that begin in cooling towers, "Ignition within these structures can be caused by welding, or cutting operations, smoking, overheated bearings, electrical failures, and other heat or spark producing sources." Cooling towers require very specific fire protection that is designed and installed in accordance with NFPA and FM Global standards. Whether the tower is crossflow or counterflow, a fire protection system can be designed to meet its needs. Read more about cooling tower fire protection needs here. Another item of note is the corrosive nature of cooling towers. Because of the wet environment, fire protection can deteriorate faster than in other environments. Contaminated water, lack of pH balance, and the warm environment can lead to the deterioration or corrosion of fire sprinkler piping. It is important to schedule annual inspection, testing, and maintenance to ensure that the fire protection is still up to par. Read more about the deterioration of cooling tower fire protection here. Lube oil is the most common cause of turbine fires. In a recent study referenced by FM Global, during a 15 year period, 17 large turbine building fires resulted in $400 million in gross loss. Lost generating capacity was at 20 million MWh. The average loss per fire was $24 million US dollars with an average of a 24 week outage. Learn more here. In the FM Global report referenced above, FM Global sites fire events in which fire protection was present. In example one, a hot surface ignited leaking lube oil on a steam turbine; employees activated a water spray system. The fire was extinguished without property damage, and the generator was only down for six hours. In example two, an oil leak in a gas turbine started a fire. The fire was suppressed with gas suppression. It limited the damage to $20,000. That is a 199.66% reduced damage cost from the average. For steam turbines, the best automatic fire protection system is a water-based system, which can act quickly and tap down the fire. For gas turbines, F.E. Moran Special Hazard Systems recommends inert gas fire suppression. Inert gas is a good alternative to Co2 suppression because it is non-lethal and safe with humans present. Much like turbines, a generator's main fire hazard is lube oil. Lube oil may be released during any number of maintenance errors or due to deterioration. Lube oil is often released in a spray formulation, due to the high pressure. Spray lube fires become large fast, and it is very necessary to have fire protection present. The best fire protection for a generator fire is inert gas. It will not hurt the equipment or affect the health of nearby plant personnel. Compressors have natural gas that can leak and cause explosions and subsequent fires. Natural gas is dangerous in quantity of over 5%. When natural gas reaches 5-15%, it can explode when temperatures reach 1,165 degrees. Considering an undeveloped, post-flashover fire is about 1,000 degrees and a fully developed gas fire reaches about 1,500 degrees, it won't take long once a fire spark ignites for the natural gas to reach an explosive level. Natural gas also has the added danger of being colorless and odorless. A scent is added to natural gas, but if it is going through soil, the scent could be scrubbed. Another issue is natural gas' tendency to reignite once extinguished. The best fire protection for compressors is gas detection and fire sprinklers. Gas detection can alert plant personnel of a gas leak before it grows out of control. An automatic fire sprinkler system will keep the fire under control before it can spread and possibly extinguish it. If you follow power industry news, you will see transformer fires peppered throughout. Transformer fires are dangerous and hard to control. They usually start with a short-circuit. A small short-circuit creates an electrical arc that vaporizes the oil within the transformer. In less than a second, an explosion can happen. Deluge fire sprinkler systems are recommended for transformers. Transformer fires are fierce and need immediate, thorough action. Deluge fire sprinklers drench the immediate area, pouring water on the transformer. This helps control the fire until it can be extinguished. Protecting people, property, and production is a top priority for all businesses. Power plants can reduce damages, their staff's safety risk, and lost production time by installing and maintaining proper fire protection for each area of the gas-fired power plant. With a surge of gas-fired power plants joining the power market, now is the time to take action, and ensure that your plant's fire protection is up to code and ready for when a fire ignites.